Easy to assemble! All the pieces come in the back of the headboard! Create a contemporary sleeping space with the sleek Karpos bed by Baxton Studio. The rectangular MDF frame is padded with soft foam padding and wrapped in polyester upholstery for added comfort. Choose from two colors and three sizes that all feature grid-tufted details for modern style. The bed assembly was very straightforward. Mostly pleased overall by the support of the frame and the look. Only complaint is that my mattress has to be staggered about 1.5 inches because of the headboard so the lip of the bed hangs over the box spring ever so slightly at the bottom. Overall I think it was a good purchase. We got it at a great price and it wasn't terribly hard to assemble. 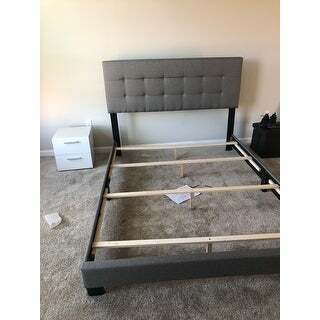 This was for a double bed, but there is a good inch or more on each side between the box spring and the frame, so I wonder if they just send the same frame for both a double or a queen size? Easy to assemble, pretty color. Not very sturdy, we had to add more slats. 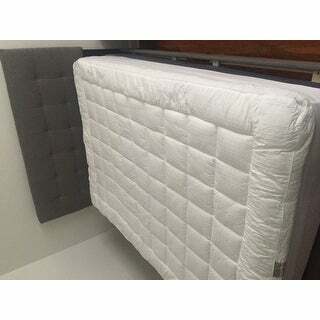 We bought this with a Lucid 10 inch foam mattress and the bed frame couldn't support the terrible mattress. We added more slats and a box springs. It's way too low and hard to get out of if you don't add some height. Received this bed earlier than anticipated. Super easy to assemble. The slats that come with the bed are not as sturdy as I had hoped. I have opted to buy a few 2x4's to be safe. Also, the connect from the frame to the bed leaves a little to be desired. All and all I think it is worth the money and will suffice until I upgrade. I do really like the look of the bed. Much lighter weight than I expected. And about 3 inches lower than my previous bed. It looks good and stylish. Fits my decor. The wood slats under the boxspring seem less sturdy than expected. I hope it holds up well. We were very happy with this purchase...the color was what's described..beige. I give it a 4 star because it was about an inch in circumference too big. We made it work since only one side shows...we pushed it closest to that side and I filled in the other side with cloth covered foam...that way I can't see the boards. All the parts are hidden in the hardboard. The parts are all perfect with all the directions clearly written. My husband and I put it together in maybe 30 minutes. The bed is super sturdy and beautiful!!!! Don’t even think about it, GET IT. Just a really high quality piece for the price! Looks really great. My husband said he hated it when he saw it online but changed his mind when it was in our bedroom. Now he really likes it, especially because the headboard is cushioned so he can lean up against it to watch tv. I think it looks elegant and it is really great quality for the price. The package was super heavy (around 75lbs for a king) so I opened it and had to take it upstairs piece by piece but was able to put it together by myself while my husband was out of town. The only warning I give is the height of your mattress and boxes. We have regular boxes and and very thick mattress so it covers more of the headboard than I would have liked. If you have a super thick mattress I might recommend low profile boxes. Also take the color of room into consideration - mine matches the wall a little too closely. This bed frame had very good reviews so I decided to get for my toddler son. 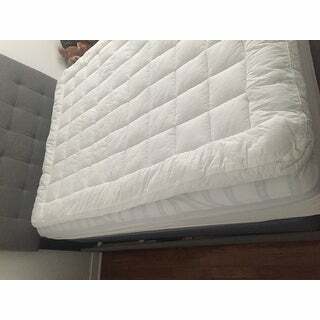 I got him a new full mattress with box spring and have searched everywhere for a bed frame I could use the boxspring also and not cover the headboard. This was it! He absolutey loves his bed frame. I put it together myself and was easier than expected. Its very nice and modern looking. Which was the look I was going for. There is a weight limit on this bed. But his father which is 240 and me 125 have both layed on the bed with our toddler and it was ok. I wouldnt recomend to use for everyday use with alot of weight cause of the weight limit. I really do love this headboard very cute and nice good quality material. One screw was missing to screw down baseboards and I read many others said the same. But you can easily use another screw. I give it 5 stars and would definately buy again! Really like this bed! It’s made nicely and looks great made up. Really great for staging because everything is compact into the headband. Ingenious. Easy to put together, Did it by myself. Looks great in out guest room. Sturdy. Would like to have it in my room, might have to order an other one. I read all reviews prior to purchasing this bed. Doing a remodel. Opened box and was disappointed to see black marks on upholstery similar to what you would see from newsprint rubbing against it. Took pictures then used Woolite fabric and upholstery cleaner. Took it right off. Scotchgarded it and put it together. We used MDF to reinforce the pieces holding up the headboard because we want to lean against it, it was a bit wobbly and it worked. Our queen sized box spring dropped right into the space. We are really enjoying our new bed. Reviews were right, a bit of reinforcing could be in order, but we are pleased. I thought I was not going to like this headboard . But I absolutely love it . Came out stunning looks like a million bucks !! Fabric is amazing . Doesn’t feel cheap at all can’t wait for everyone to see it . Looks nice. I bought it to replace wooden bed with high footboard that gave me a bruise every time I walked past it. Feels sturdy. It was easy to put together too. We love the look of this bed frame! Was super easy to put together and a great price. We still put a low profile box spring in and we like it that way. This is a good buy for the price. It’s not super solid and pretty light weight but I am happy with the purchase for our guest room. It was very easy to assemble by myself. I don’t like the two panels on the sides with the leg in the middle. The fabric quality is good. It is very light weight so I put the mattress on a separate frame just in case. I like to have euro shames on my beds and the headboard is too short for them as they cover it. Overall I am happy with the purchase for occasional use in our guest room. I think it could bebuilt a little sturdier, seems a little cheapish, had i Known how this assembled I probably would have gotten something else. Looks nice though! Time will tell. I like my new Braxton studio Karpov modern upholstered grid tufted bed its easy to put together. 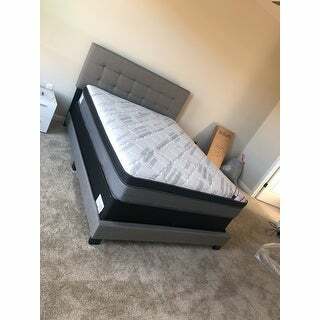 My friend wants to get one all I need is my mattress now but I can’t find one I like this was my first time buy from overstock.com and it was easy. Think I will buy all my stuffs from them . This bed is just as beautiful in person as it was in the pictures. It was really easy to put together and I just love the material its made from. Very high quality Bed. 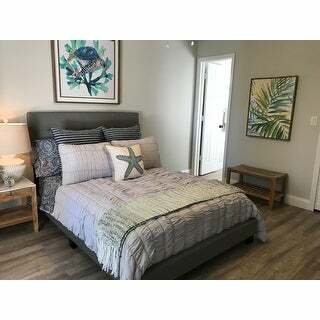 I really feel like it is the best purchase Ive made on Overstock so far based on the cost and the quality of this bed. Highly Recommend it!! "will the queen size bed in beige go back in stock?" "What is the height of the legs? What height from floor to bottom of frame?" "Is the beige a true beige color?" This is a beige color. "What is the clearance from floor to bottom of of foot board?" The clearance from the floor to the bottom of the footboard is approximately 8.19 inches. 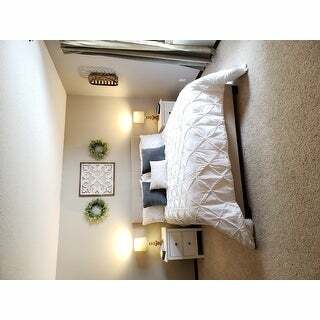 "what size box spring should be purchased with queen size"
A queen size box spring will work. I hope it helps. "what size box spring should i get for the queen size bed"
"What type of King size mattress is included"
This bed does not include a mattress.